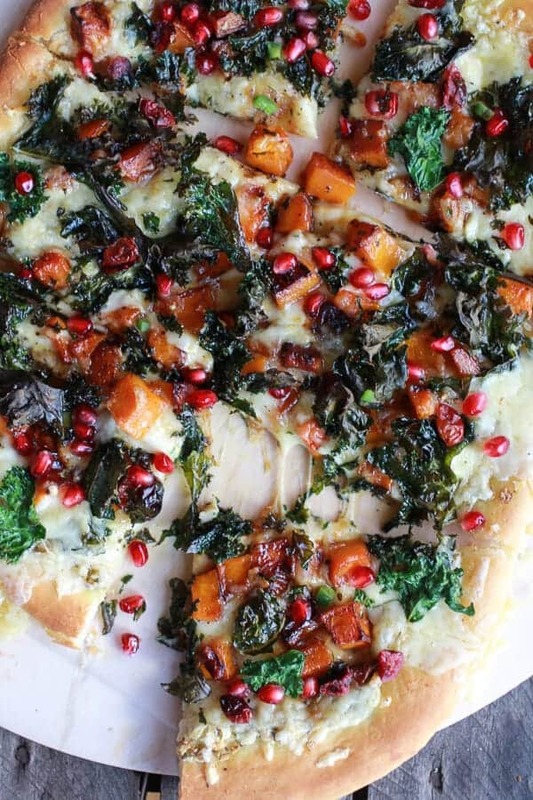 Obsessed with all things butternut, pomegranate and cranberries. Yesterday I made three recipes featuring either pomegranates and/or cranberries. I am pretty sure that as I write this the floors around my house are sprinkled with big bright red cranberries. Hey, at least it’s festive! Also, when I set out to make this pizza, I promise I did not intend for it to look like Christmas exploded all over. Really, I promise. But I mean, come on. This has got to be the prettiest pizza I have ever made, and I personally love the red and green colors. I wanted so badly to wait until December to post this, but my excitement gave in. I have been dying to tell you guys about this since October sixteenth. And I only know the exact date because that’s what it says on the photo info, really, I have not been counting the days or anything….. Looking at these pictures, I just have to tell you guys the story behind this pizza. I was overly exited about this pizza. So excited that when I took it out of the oven, pizza pan in one hand, salsa in the other, with a pizza cutter, forks and a towel some how in my arms as well, I tripped. Yes. I tripped with everything in my hands. And no, I did not catch myself and land on my feet. Nope, the complete opposite. I landed sprawled on the floor, pizza five feet away, a broken bowl (that I LOVED) and pomegranate arils everywhere. It ended with me in tears. Tears that led me to pick up the pizza, throw on some more cheese, melt it, make more salsa and shoot the torn in half pizza. Let’s just say it was a long day. A long day that ended in the best way. If you are not into the salsa, it is totally optional, but I loved it! Plus, oh my gosh it makes the pizza so pretty! I love, love, love the colors!! It is perfect for both Thanksgiving and Christmas entertaining. Serve it as meal or cut it up into smaller pieces and serve it as an appetizer. People will be so impressed. Plus, it is so good. And there are loads of fontina and caramelized butternut squash in it. Oh, and did I mention I am also obsessed with caramelizing pretty much everything I can? 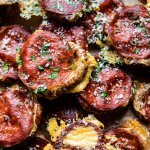 Yes, lately I am loving all things caramelized! It is perfect for both Thanksgiving and Christmas entertaining. Serve it as meal or cut it up into smaller pieces and serve it as an appetizer. People will be so impressed. This looks divine!!! Love the photos, so festive! Oh. Myyyylanta! This is the most festive and delicious pizza I ever did see! I could easily see myself tripping, falling very un-gracefully and letting pomegranate seeds fly all over the place out of excitement for this thing. Hopefully you’ve recovered from your fall my dear, and good thing you had a nice pizza to heal your wounded body and soul 😉 YUM! Thanks Julia! It was not a bad fall for me, just for the food! Oh and trust me, there was nothing graceful about this fall! 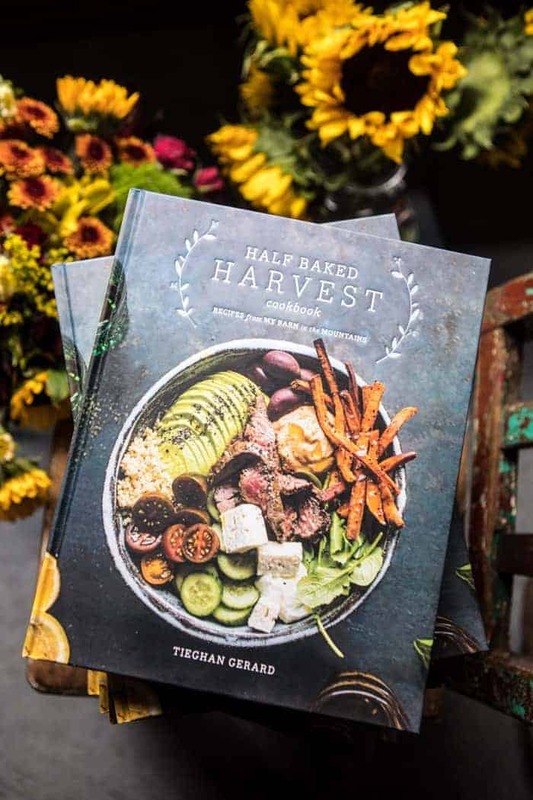 This looks delicious Tieghan! All the flavors, I need to start making more exciting pizzas like this. Oh and I have no doubt you can make one awesome pizza!! 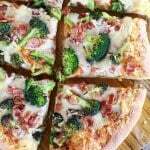 Pizza is the most requested meal in our house so I’m always excited to try new recipes to give it some variety. Love the kale here, will come right from our garden! Thanks Pamela! Hope you love the pizza! yumm this sounds divine! I’m inclined to use baby spinach instead of kale, I’m just not a kale kinda chick! 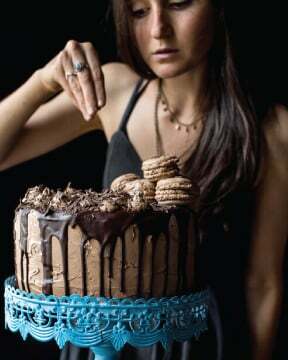 But that swap aside these look divine, great recipe T! I bet baby spinach will be just as good! Thanks so much, Christine! Hope you love the pizza! 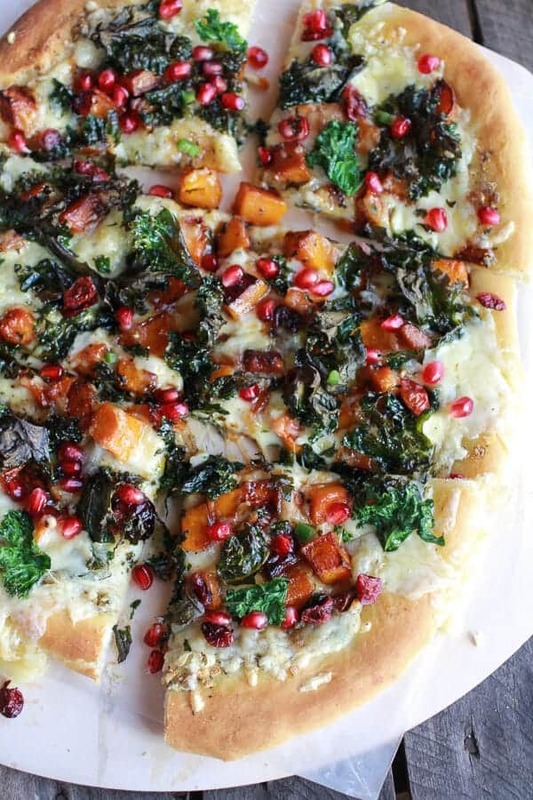 I freaking love squash pizza and with this fontina and pomegranate? You have my number! Thanks Erin!! 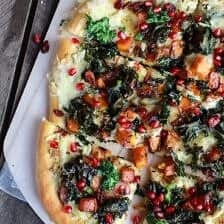 I love fall pizzas!! 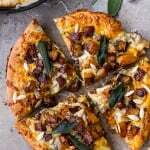 You had me at butternut squash!!! Sorry, I type too fast! This is perfect! So pretty and I bet it’s delicious. This pizza is so pretty! And yes, it does look like Christmas exploded all over the place. Haha! It’s awesome. And I’m sure it tastes phenomenal. 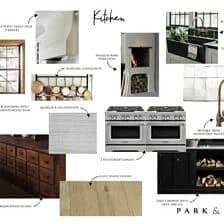 I can so relate to your kitchen survival stories. Many, many adventures have ended in tears for me, too. This is amazing!!! 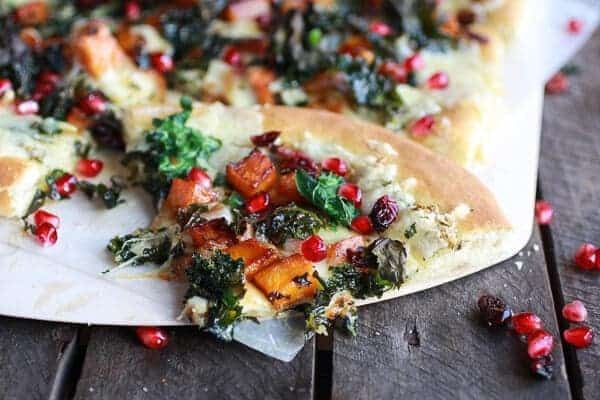 I LOVE all those Christmassy flavours – caramelised butternut squash is the BEST – and obviously I love pizza too (who doesn’t?) so this is right up my street! Love it! This pizza is *so* pretty! You can’t even tell it fell on the floor. Yum! just found your blog today and i’m already such a fan! 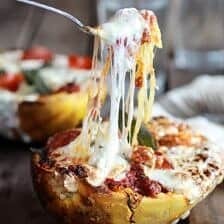 beautiful photos and great recipe ideas! what kind of camera do you shoot with? i’m researching for my dslr purchase and would appreciate any advice! thank you! Hey Vicky! Thank you so much!! thanks for your response! do you recommend any additional lenses? thanks tieghan! I use a 50 mm Macro lens! This looks great! I love all those flavors. And I bet a little tart pop from those pomegrante seeds really makes the whole thing! Yum! Definitely wanna try this!! I’ve been on a homemade pizza kick and this one is seriously gorgeous. I love all the fall toppers, especially the pom salsa! 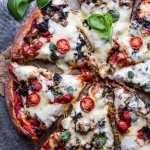 Nothing beats homemade pizza and I am sure your are amazing!! Thanks Laura! I just bought pomegranate seeds yesterday and I am super pumped to use them. 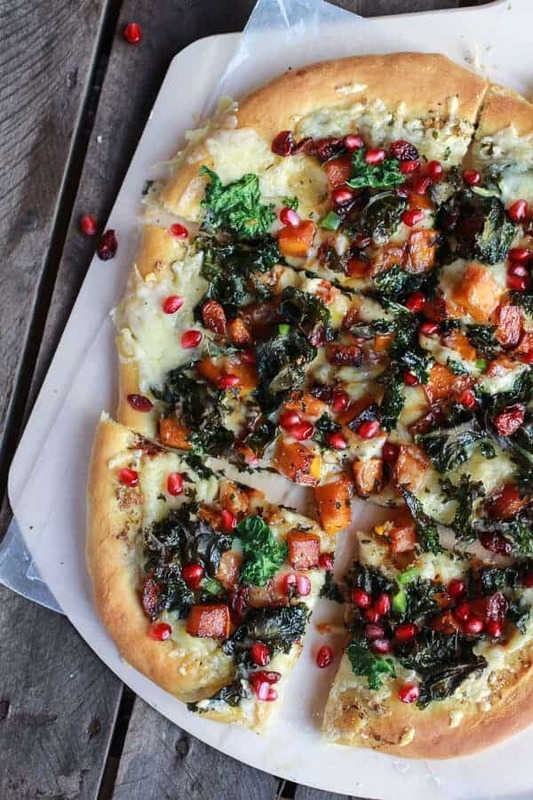 This pizza looks amazing with the fall flavors on it. Thanks so much, Meagan! Enjoy those pom arils! 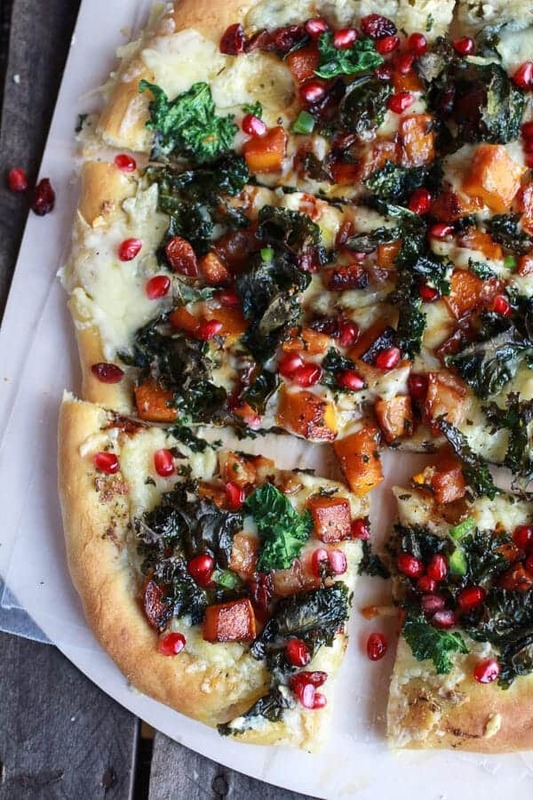 Butternut AND kale on pizza?? Yes, please!! I will definitely be trying that out. Thanks Hannah! Hope you love this! 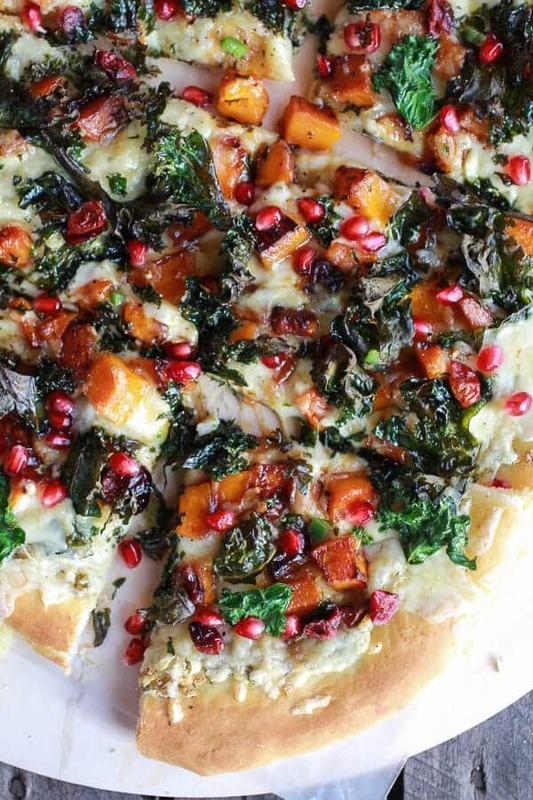 We make a kale salad with pomegranate seeds every night to go with dinner. Hooray for the pizza version!! P.S. I hope you’re feeling okay after the fall. You doctored up that pizza so well. You’d never know if you didn’t say anything. I love kale salads with pomegranate seeds!! YUM! And thank you! It was not a bad fall for me, just for the food! GORGEOUS!!!!! And yay for pizza today, yo! Thanks Lauren! Yours was pretty gorgeous too!! woah i love that second photo with the caramelized butternut!! i loooove pizzas! Thanks so much, Julie!! 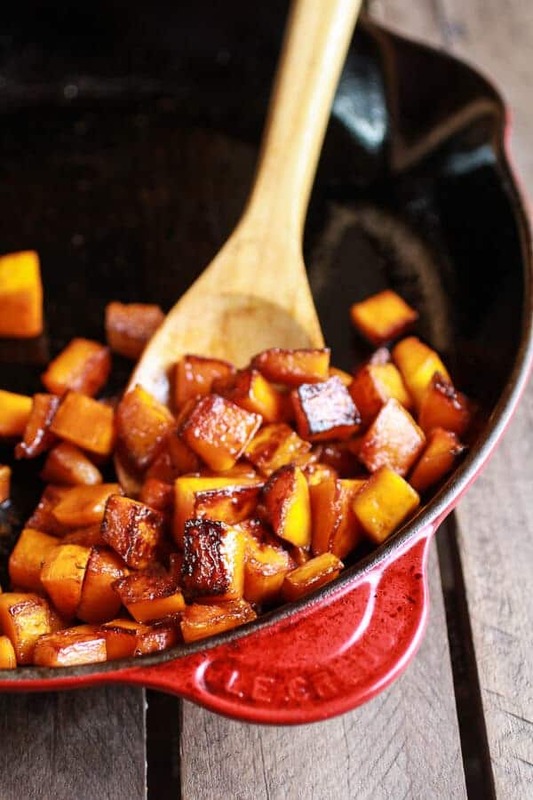 I am loving caramelizing squash! Thank you so much, Molly! I bet that lasagna is awesome! I mean it when I say…. I have never wanted a pizza as badly as I do this one. Gorgeous! Wow, this is gorgeous! Who cares if it was dropped on the floor. That adds extra flavor. Totally gorgeous, I’d have never guessed it hit the floor. I hate it when my favorite dishes break! Thanks Gaby! Broken food stinks! So glad I was the first to make this awesome pizza. Went to the grocery after work and made this AWESOME combination of flavor …. My mouth was dancing! My heart totally clenched up during the tripping explanation — the absolute worst. I’ve been there before… You sure did work wonders with the pizza though, because it’s still STUNNING!! 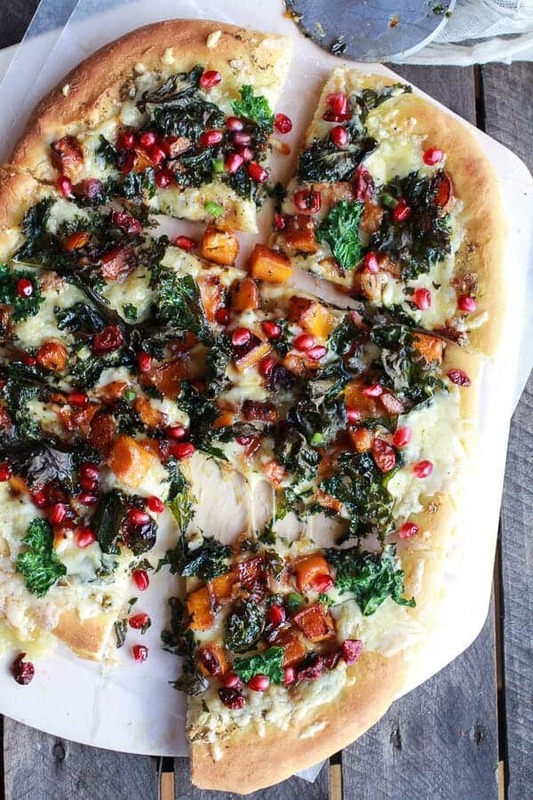 A Christmas pizza, I think this would make a beautiful appetizer at a holiday party. Thanks Sherry! I think so too! Absolutely gorgeous! Love the colors, all the caramelization, & melty CHEESE! Oooh, I love all things caramelized too! I also love how the kale gets crispy. I don’t know if I’ve seen such a pretty pizza! 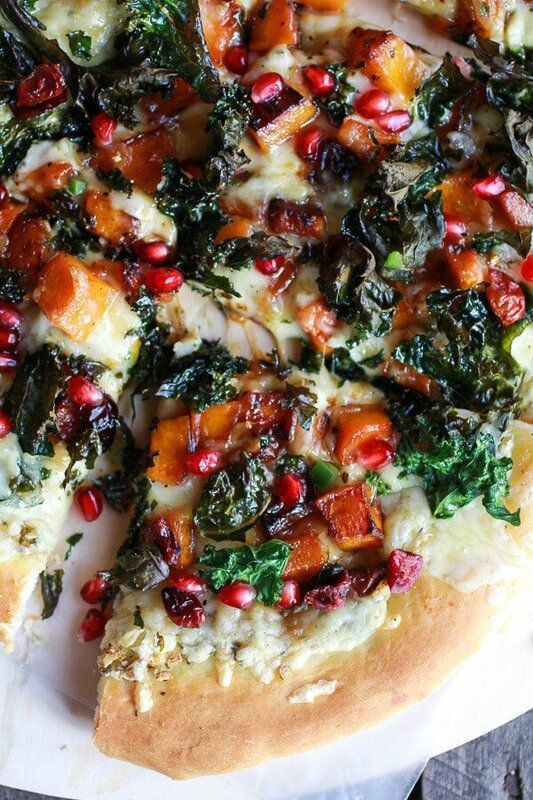 omg this pizza is absolutely gorgeous and so darn festive! I love it all..and the toppings…ahh they’re out of this world! Definitely pinning this one for later! LOVE IT! Thank you so much for pinning, Alaina!! This looks like perfection. Everything I love bundled together, and I will be making this the second I get home from the grocery store tonight! Question: because I have a tendency to be somewhat lazy in the kitchen on certain things (namely – fresh baked bread and pizza dough), how awful would it be to use a Traders Joes pre-made pizza dough? Will it ruin my whole pizza? SO SORRY! I somehow missed this comment the the other night. I hope everything turned out great! A trader joes pizza crust would work great! Really hope you loved the pizza and again, I am so sorry for the lateness! Thank You, Thank You, Thank You This was fantastic. I don’t cook but am trying to learn while I train to be a health coach. Made this last night for a Christmas get together (almost bought a store bought pizza but pushed aside my fear and went for it )….everyone raved. I am so proud of myself and it was so yummy! This was delicious!! My husband used ‘mind blow’ to describe it and rated it a 10/10. I loved it too. So delicious and made with wholesome ingredients. I was skeptical about the salsa but its pretty darn good. The only thing I did differently was sub the pine nuts for walnuts as I was fresh out. I cant wait to try the recipe again with pine nuts. You are one creative lady! T, I made this again. Seriously, this is an incredible recipe!! It tastes just as good the next day and even cold! I was not able to make the salsa this time around 🙁 as I have not been able to find pomegranate for weeks. Do you have any suggestions for a substitution and/ or an alternative salsa recipe? 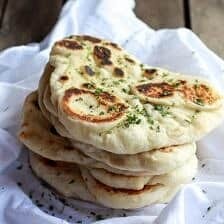 Also darling would love to see your take / fusion approach on an indian recipe. oh and a fancy polenta recipe would be wicked! I tried a Bitman recipe for polenta that kind of bombed. You are brilliant. Don’t you forget it! I would try an fruity salsa. I love mango salsa or I think strawberry would be great with this too! This pizza is unreal. The cranberries are such a nice touch. Kind of devastated that I’m not having it again tonight. Anyway, thanks for this. 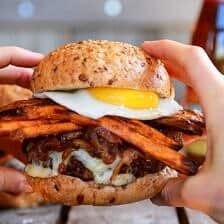 I just wanted to thank you for this amazing recipe .. see Ive been just googling some recipes and this came across.. and I wanted to cook it right away ! and now He is asking me to do it again ! he absolutely loved it .. me too !! it’s very balanced and creative .. Love your blog keep them coming !! Yes!! This is awesome! So happy you guys love this pizza. Thanks!! This was AMAZING. The salsa is a MUST. We made this pizza last night and it was AMAZING!!! We tweaked a few things – added some chicken and sage sausage, used basil pesto instead of sage pesto and kept the Jalapeno seeds in for some extra spice! 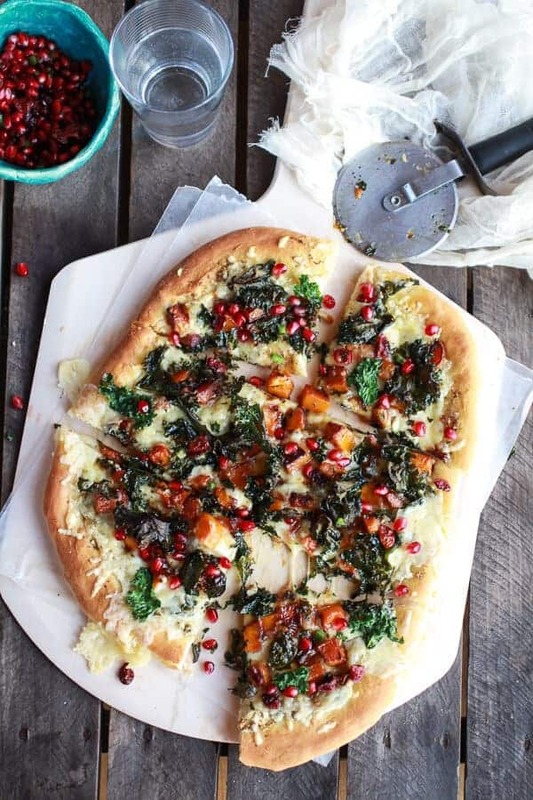 The pomegranate salsa adds the perfect crisp and brightness to this pizza. We will be making this again! SO happy you love the pizza! THANK YOU!! Love the sage sausage addition!